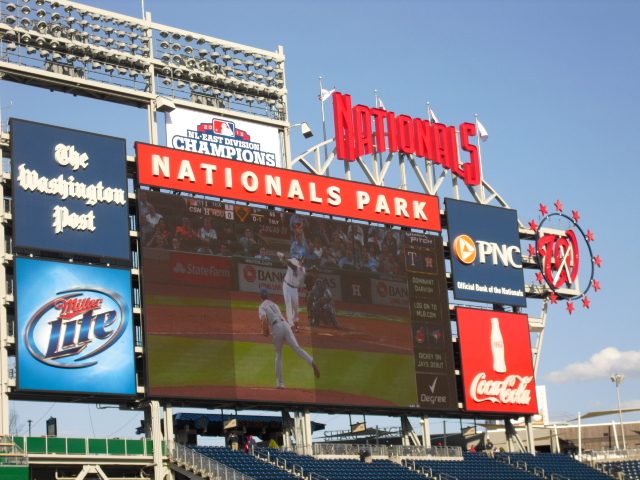 Once I saw that the Marlins were going to open the 2013 season in Washington D.C., I immediately targeted Wednesday April 3rd to be my first game of the year. March was a particularly cold month in the mid-Atlantic region, and unfortunately the cold temperatures carried over into this first week of April, making Wednesday night frigid. Thankfully, it was sunny and in the mid-50s when I arrived at Nationals Park at around 5:15. I immediately headed to the Red Porch as the Nats were taking their last few rounds of batting practice. But things were dead. 1) Early in the season, players are trying to get their swings down and spray the ball around the park, since they haven’t played in a real major league stadium since the previous season. 2) Due to the cold temperatures, hitters are even less likely to over-exert themselves, trying to avoid pulled muscles and other such weather-related injuries. In addition, pitchers are preoccupied with keeping themselves warm, and are therefore less inclined to interact with fans. 3) Even if a player were to have hit a long ball, the wind blowing in from left field would likely have killed it before it reached the seats. A combination of all of these things led to a mostly dead batting practice. I spent 80% of the time between 5:15 and 6:30 at the Red Porch, and I believe only three home runs landed in the section. The first was an uncharacteristically deep blast hit by a Nationals righty I cannot name. It landed above the cross-aisle near some people eating at the tables, and bounced toward back of the porch to a stadium worker. The second one was a laser line drive that landed in the first few rows of the section, where it was more populated. I was standing near the back at the time, and I didn’t feel like fighting people for it. By 6:00 or so, the Red Porch was populated by a dozen or two sedentary fans who were not interested in catching baseballs, rather taking pictures or eating in their seats. This severely limited my mobility. 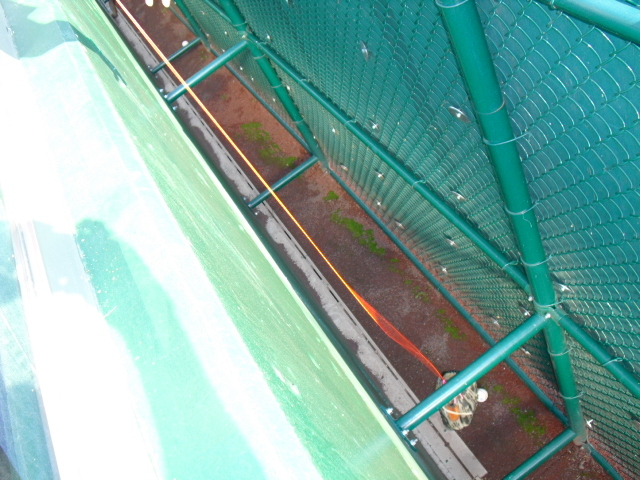 The last homer to reach the porch was hit by a Marlins righty and landed at the bullpen-end of the section, and at the time I was standing on the other side by the batter’s eye. As always, there were small-ish kids populating the first row of the porch, begging for toss-ups from players. A little while into the Marlins’ session, a pitcher finally turned around and lobbed a ball to a pair of kids, but they bobbled it and dropped it into the gap…bummer. I could tell they were disappointed, and a guy who appeared to be their father thanked the pitcher anyway, and, after jokingly alluding to climbing down there and fetching the ball himself, appeared to give up. I walked down to make sure the ball was indeed sitting in the gap, and hadn’t fallen back onto the field, and told the guy that I could get it for him. I whipped out the glove trick and reeled the ball up within a few seconds, and gave it to the kids. Not that I really keep statistics, but I suppose that was my first ball of the season. A few minutes later, Ricky Nolasco trotted out of the dugout straight to center field. He was chatting with some of the other Miami pitchers out there when a ball came his way. Lackadaisically, Nolasco fielded it, and seemed to be in no hurry to throw it in. The kids and other fans in the section let out their customary “here, ball please!” to Nolasco, but gave up after a few seconds. As soon as they stopped, I let out a simple, “Ricky!” And raised my arms. He spotted me in my teal hat and gave me a simple toss. That was incredibly gratifying. 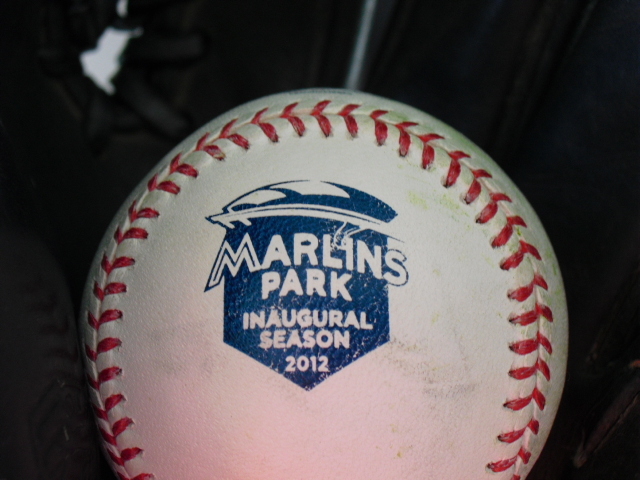 It got even more gratifying when I peered down at the ball in my glove and saw that it was a Marlins Park commemorative baseball. It came a year after I expected it, but I had finally snagged a Marlins Park ball! Last season, the Marlins used these special baseballs at home for both games and batting practice, but on the road they used BP balls from the home team, and only threw with their own. Since I did not go down to Miami during the regular season, and I almost never beg for toss-ups from players, I was unable to snag a Marlins ball last season. I got one for my birthday, for its souvenir value, but I was much more satisfied when Nolasco threw me one on Wednesday. That was it for batting practice: two gratifying baseballs. Then it was time to find out if the Marlins’ bats could be any warmer than the April air. SPOILER ALERT: They were not. Kudos for you kindness! Payback with a commemorative ball? I’m thinking so!